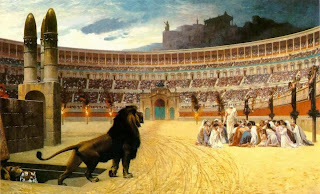 In Him... : Persecution - Have You Heard the News? Last Thursday was a day in which thousands of people from all over the world prayed for the release of American pastor, Saeed Abedini, and for millions of other persecuted Christians worldwide. We are living in a day and time when persecution against Christians seems to be on the rise like never before, and unfortunately, at least until recently, the church in the West has largely ignored it. When is the last time you heard a sermon (or prayer request) for the persecuted church? It is not generally a subject one would bring up in “polite” conversation. Yet, every year, thousands of Christians are persecuted or killed for their faith. Estimates range from 105,000 to 176,000 Christians are martyred every year, or to put it another way at least one every five minutes. Maybe the reason we in the West have not become more activated about the suffering church, is because we have not heard about it, or because it doesn't seem to touch us personally. Perhaps we have simply chosen to ignore any news that seems to be distasteful. There is a temptation to treat news about persecution like we treat a fundraising commercial on TV. You know, one of those commercials with the pictures of starving swollen-bellied babies who are suffering because of a famine in some obscure part of the world. Is it so easy to just ignore what is happening in the world? Is it simply too easy to just change the channel? Persecution stories are ugly, and scary, and distasteful, and why should we be bothered anyway? We don’t want to hear about suffering and death. We want to stay in our safe little bubbles and close off our eyes and ears to the cries and bloodshed. Although much of the media has been slow to recognize or discuss the topic of Christian persecution, more and more sources through the web (and even some mainstream media) have been talking about it. Many Christian Advocacy groups have come forward to speak for the persecuted church. Over the years, most of us have probably heard about Christian martyrs, starting with Stephen, the first martyr, and we have probably even read books on the subject, like Fox’s Book of Martyrs. However, for many believers today, the idea of Christians being martyred is foreign to us. It somehow seems far away, or historical. After all, in this modern world, who would think that we might not be safe? We feel that way, especially in the West, where almost all governments claim religious liberty. No one wants to think it could happen, but it is happening all over the world. It is costly for the Kingdom of God when Christians are killed or forced to flee because of persecution. Tertullian wrote that "the blood of martyrs is the seed of the Church,” and it is true that often times history has proven out that the places where Christians were persecuted and martyred have become the places where the church has grown, and flourished, and shined! The church in the Middle East, has not always had the same experience as the early church did. It took a persecution to move the church to action to reach the nations. After Stephen's stoning and martyrdom, during the time of the persecution of Saul of Tarsus (whom later became Paul the Apostle), the church in Jerusalem was forced to take the gospel out to Samaria, Judea and beyond. A missionary movement started that has not ended. And the church grew. When I think of the church growing under oppression today, the underground church in China comes to mind… When Western missionaries were forced to leave because of war and the communist revolution, the underground church grew exponentially. Please pray for our persecuted brothers and sisters. They need it. Please also take some time and read some of the links that I have provided below.